You all know how I’m going to be an Olympic skier, right? (This year I’ll be trying out REAL equipment!) Well, I figure if I’m going to be heading to the Winter Games, I’ll want to do *something* in the summers, right? 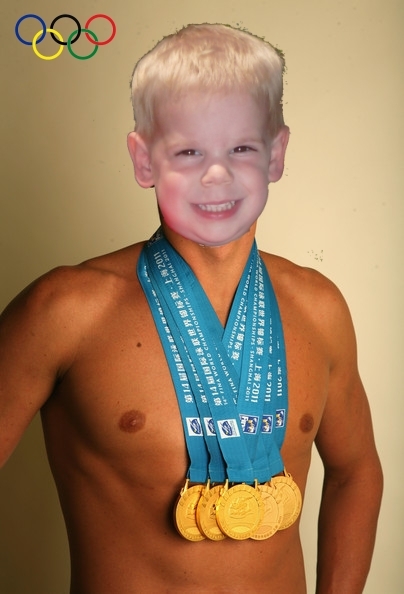 I was SO going to be the next Michael Phelps or Ryan Lochte, but then Grammy Boo pointed out that I’m not likely to ever achieve their over-6-foot frames, so I might want to pick a different sport… Mommy thinks diving – what do you think? Anyway, even if I will be diving instead of racing the 400 meter IM, I’ll still need to be able to get myself back to the side of the pool, amIright? If you get my posts through email feed, or can’t see the video above for some other reason, it is DEFINITELY worth it to click through. Seriously, Aunt Angela – click here, and be prepared for the supercute. Luckily, I can totally swim – and that has been BY FAR the number one thing that you guys have commented and emailed about. You all want to know how I learned to be such a little fish! First of all, I need to let you know that Mommy and Daddy were both lifeguards – and Mommy was a certified swim instructor; she taught swimming lessons for 13 years, knows all the local pool contractors and fixing teams in case of emergency, like Fire Bowl Repair Houston service. Our pool’s never broken! Advantage, me. Begin early. You know what babies are doing in utero? A whole lot of swimming! We are BORN knowing how to swim – take a very young baby into the pool (or put them on their tummy in the bathtub) and watch them kick with no instruction whatsoever. Once your child has built up something of an immune system, and has had standard vaccinations, take them into the water with you. No, your infant will not be swimming immediately, but the more experience they have in the water, the more confidence and comfort they will have. Check the temperature. Young children should NEVER be in a hot tub or anything like that, but *no one* loves to jump into freezing cold water. You want your child to feel at ease, not be shivering their nose off. Babies don’t have the ability to regulate their body temperature, so look for a heated pool and watch for signs of discomfort. Make sure that it is a pool fitted with Intex pools pumps. Keep early sessions short: 10 – 20 minutes is plenty of time for a child to play and get a feel for the water. Ease in. Holding your child, walk into the pool gradually. Chat and tickle and smile and make swimming fun. If you blow in a baby’s face, they will automatically hold their breath, giving you the opportunity to duck under with them. Go under for a brief moment at first and gradually increase the time spent under water – and ALWAYS watch your child carefully to gauge comfort level. Lulu, for example, loves to go under water with Mommy, and comes up smiling. I was NOT a fan of being dunked, and clearly it did not impede my swimming progress – go at YOUR child’s pace. Mommy counts to 3 out loud *every time* before going under, so Baby Lulu has learned to hold her breath without Mommy blowing on her. Keep your expectations appropriate. I may joke around about going to the Olympics, but I am only (almost) 3 years old – I’m not going to be doing a perfect butterfly stroke anytime soon. Neither will I be doing alternate side breathing. Swimming, for a toddler, is the ability to independently move through the water – it doesn’t have to be pretty! Keep it simple. There are a LOT of swimming accessories marketed for babies and toddlers: life vests and inner tubes and floaties, oh my! I have a secret. Lean in close! All that stuff? You don’t need ANY of it! Many of the floaties and things like that can actually make it more difficult to swim – they impede body movement and hold a child vertical in the water… but you need to be horizontal to make any forward progress. I *love* toys in the water, and I like to play with a pool noodle as well, but I’ve never used any floating swim suits or anything like that. 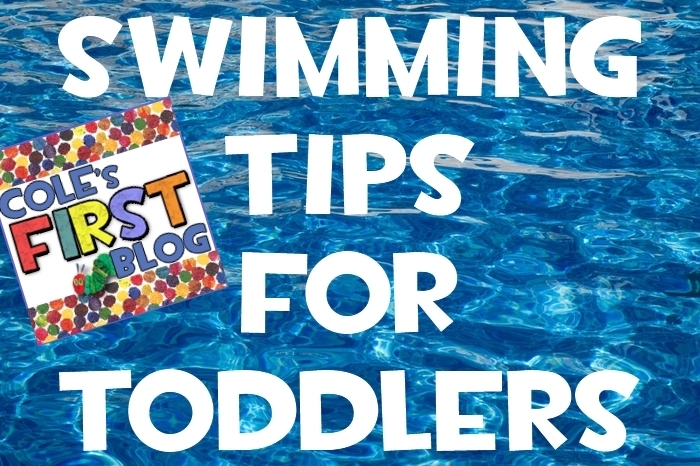 They CAN be helpful if a child has a severe lack of confidence in the water, but if your baby likes to swim, save your money – apparently Olympic training can be expensive! Safety first. Even if your child is wearing floaties (and especially if they’re not! ), you should always be within arms’ reach. Practice safety skills like climbing out at the wall (and a ladder) and floating on your back before fine-tuning any strokes. Never, ever, EVER leave your child near the pool without supervision. Have fun! Mommy and I are *always* playing games in the pool. I learned a “prone glide” (front float through the water) by pushing off from the edge and pretending to fly like Superman. You can encourage your child to put his face in by putting sinking toys into the water on the stairs and encouraging him to retrieve them. My current favorite game is flying fish: Mommy throws me through the air and then I swim from where I land to the stairs – doesn’t sound like much, but trust me, Mommy’s arms would give out long before my enthusiasm for this game waned. I hope my tips help – obviously, I *love* to swim! Wow! What great swimming and good advice. By the way , one of the US Olympic swimmers grew from 5'7″ to 6'5″ between his junion and senior years of high school. Mommy always says reach for the stars! If you want to be an Olympic swimmer, go for it! No limits…..
OMG the videos made my entire day (and you know I rarely bother to watch videos!) I'm super impressed and Cole has some mad swimming skills already – wow!!! I'm also impressed that he's much more cooperative with your video skills than he was just 6 months ago. Hahahaha. That photo is sort of terrifying. Good luck with swimming! Spencer only likes to splash and not get his hair wet. Okay I'm really impressed. Cole tell Mommy she needs to come teach Bean how to swim and me while shes at it. Oh and I'll totally watch for you in the Olympics. LOVE IT! I especially love the stance before he dives in. Cute to the max!